VILLA CAMPO can be rented with 5 bedrooms for 10 people (possible only during Low Season >> additional guests are charged 280.- EUR / week), and complete with 8 bedrooms for groups up to 18 people. Even with 5 bedrooms you rent the property exclusive. Pisa Airport (65 km distant) can be reached easily via express highway. 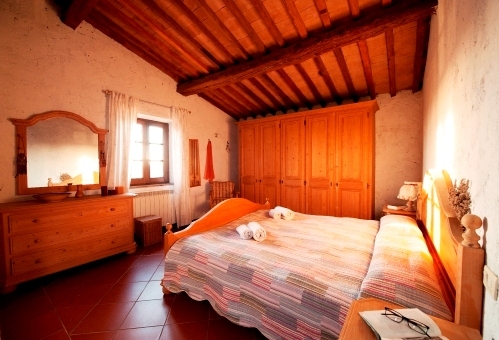 The villa of this large estate has been carefully renovated preserving the typical charme of the Tuscan country style. VILLA CAMPO is a very comfortable vacation rental equipped with all modern amenities, private swimming pool and spectacular views. Large living space of approx. 500 square meters offer plenty space for up to 18 people. The huge private garden with pool and sundeck offers relaxation and refreshment and the beautiful terraces invite to linger, read or play. On the groundfloor there are two large living spaces and a completely equipped kitchen with dishwasher, stove with oven, fridge with freezer, open fire place, washing machine and dryer. In one of the living rooms there are sofabeds for up to 3 people. Additional beds and babybeds on request. On the groundflooryou also find a reading room with SAT-TV and CD-stereo, a double room with its own bathroom plus an additional bathroom with shower. The large furnished terrace is an ideal place to relax or have dinner al fresco. Barbecue and pizzaoven are also available. The villa is surrounded by 300 hectar private land with olive groves and vineyards. Extra Cleaning Service per hour. Payment directly on site. VILLA CAMPO offers all facilities and services to guarantee a relaxing and comfortable hiloday. You will enjoy unforgettable and relaxing holidays at VILLA CAMPO close to vineyards, medieval villages and the amazing sandy beaches of the Etruscan Coast. Don’t miss a visit to the important Tuscan towns of Volterra, San Gimignano, Siena, FIRENZE, Lucca, PISA, Massa Marittimaand the island Elba, but specially reserve some time to visit the small hamlets Bolgheri and Castagento Carducci, not only for their great wines, but specially for their incredible ocean view! The wine trail of the Etruscan coast takes you from Montecatini Val di Cecina through the lovely medieval towns and villages of Montescudaio, Cecina, Bolgheri, Castagneto Carducci, Sassetta, Suvereto, Campiglia Marittima, Venturina until you reach the harbour of Piombino. Worth tasting the DOC white wine Bianco della Val di Cornia (Suvereto) and the Sassicaia dei Conti Incisa della Rocchetta, grown and produced near Bolgheri. Some believe that the Sassicaia is the best Italian wine ever. ?Hans and Christa were perfect hosts and were always available with anything we needed. They helped with directions, recommendations and made our trip go smoothly. The house had everything we needed and was located in a beautiful part of Tuscany. I would highly recommend this home and look forward to returning!? ?Wonderful home in Tuscany. Hans and Christa were lovely hosts. Great location and not far to little Tuscan towns. Especially Bolgheri. Hope to return some day ! Thanks Hans and Christa for sharing ? ?Great location, 40 minutes from Pisa Airport (don't use GOLDCAR Rentals tho!) car is essential. Local village strangely named "La California" is a 6 minute drive/30 minute walk with pharmacy, small supermarket, coffee shops & great breads & cakes. Nearest town is Cecina, 15 minute drive, great shopping, restaurants etc & train service to Pisa, Florence & Rome. Beach is only 8 minutes drive to Marina de Bibbona lots of restaurants along the stretch, we used Bagni Venere. House fab, it's an old Monastery with 3 floors & loads of beds! Fresh crisp bedding & towels and very comfortable. Would recommend if you are there for more than a week you get a cleaner once a week. Beautiful pool & outside eating areas. Wifi available for general use but not for downloading movies, gaming etc. Best all round restaurant with a view is Volte in Casala Maretimo & best one in Cecina is La Cantinetta just off the central piazza - amazing food & loving setting! Our hosts Hans & Crystal live next door & were on hand to welcome us & help us whenever necessary. Negatives! Taxis in the area are crazy money! Nobody speaks English in Tuscany so difficult to communicate - just give taxis & guests the GPS co-ordinates cos there is no name on the road! ? ?Hans and Christa are amazing hosts. They really go out of their way to make sure you are aware of the area, and to make sure your comfortable. 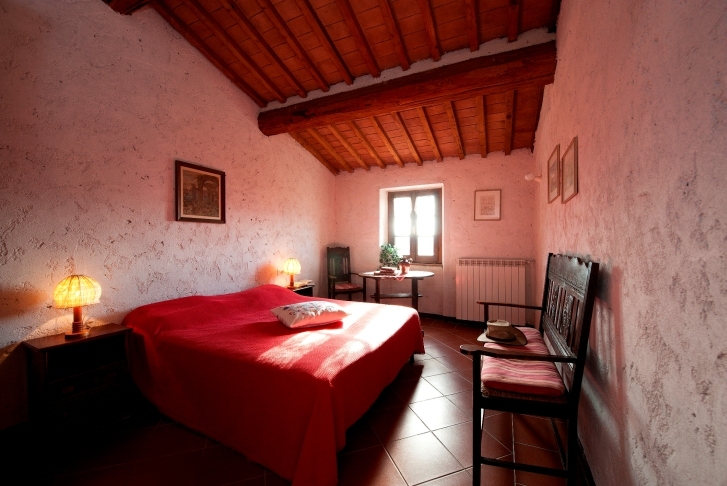 The home is amazing as while 300 years old, it is picture perfect in the middle of Tuscany, close to highways and a great spot to see all of Tuscany in a day drive. We drove to Pisa, Florence, Cecina, San Gimignano, Siena, Volterra, Livorna, Lucca to name a few. The home is perfectly situated to make these all great day trips. Further, the train in Cecina is 10 minutes away and an awesome way to get to Rome in a few hours. Thanks to Hans and Christa for their hospitality.? ?Hans and Christa were amazing and their home is truly beautiful. Out of a picture book and everything you imagine Tuscany to be. We had an amazing holiday. Hans and Christa shared their knowledge of the area and directed us to all the gems of Tuscany. We hope to see Hans and Christa soon in South Africa as we feel we have gained friends from this experience. Thank you Hans and Christa- you will forever be in our Tuscan memories? We had a absolute fabulous time at Villa Campo. The house was beautiful, clean and spacious. So were the grounds. The pool was not huge, but big enough for our group of 10 adults and 5 kids to relax, cool off and play games. The grounds and the spacious house provided plenty of room for a comfortable stay and also private if desired. Hans, the owner/neighbor was incredibly helpful with any requests. He helped us from Restaurant recommendations, ordering a chef for the house to cook (absolutely recommended!!) to organizing a round of golf and giving us tips for shopping and excursions. The location is great as well. Away from the crowds, but close enough to get everything at a convenient distance plus many beautiful and worth visiting villages close by. We can definitely recommend Villa Campo and are hoping to come back in the future.